Breeding fees include extra special care for your girls and babies at side, baby training, manicures and other routine treatments, and progesterone confirmation of pregnancy (sorry, none of our local vets do ultrasounds yet). And we won't leave you wondering where your 'pacas went - you'll get regular "letters home". Live birth guarantee and free rebreeding if the pregnancy slips. We aim to please and our studs do, too. 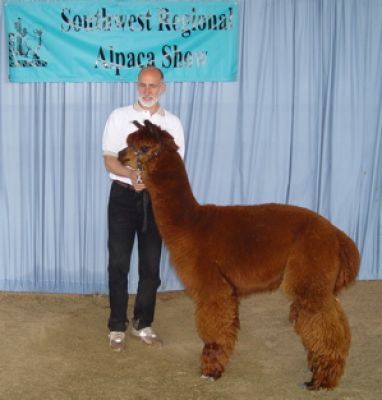 Colorado is a beautiful 3/4 Accoyo male - his dam is one of our best production females and his sire is the well-known Peruvian import Camilio, owned by Pacific Crest Alpacas. With his exceptional coverage, perfect conformation and dense crimpy fiber, his show career was amazing. He has multiple blue ribbons and reserve color champion banners to his credit, and took 2nd at the 2001 AOBA National Show. Colorado also has multiple fleece show awards. His crias exhibit exceptional coverage, very fine fleeces and correct conformation. Add to all of this outstanding presence and a great personality, and you can't lose! This full Peruvian, half-Accoyo male is so good looking we purchased his mother just to get him! With high amplitude crimp from top knot to below the knees, excellent coverage and a fleece that glows with brightness, No Fear's fiber is hard to beat. His conformation is solid and he is a very calm, easy going male. 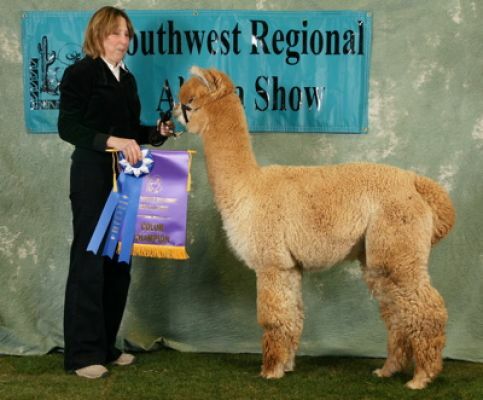 With multiple halter show ribbons to his credit, we expected his crias to have beautiful fleeces...and they do! While both No Fear's parents are white, he is throwing mostly color including dark brown and bay black. His crias have his solid bone structure, outstanding coverage and fine, dense fleeces. We are impressed! Fandango is our most recent addition to herdsire row here at Cloud Dancer Alpacas. In his first show, he took Color Champion and he has assorted other show awards. Fandango is a sturdy guy with great bone structure, spot-on conformation, and incredible coverage. 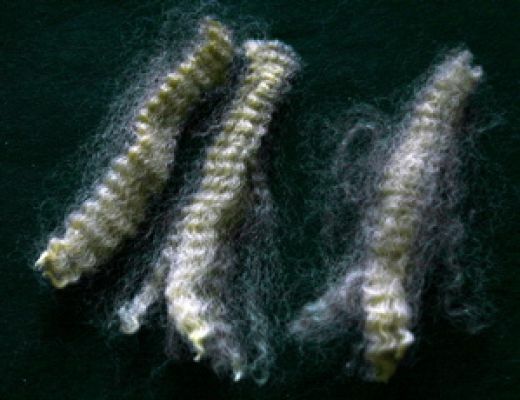 His fleece has strong and regular crimp, very long staple length, average fineness but excellent uniformity. Fandango is also very easy to handle and has a mellow personality. We love working with him -- and we bet you'll love his crias!